Green House is a live/work space at Linkebeek, Belgium designed by Samyn and Partners, in partnership with the French artist/designer Patrick Blanc. In the original plans, Samyn and Partners designed the building’s walls to be covered in ivy, while a patinated copper material was chosen for the roof. During construction, the original concept for a "green" façade grew stronger and the ivy and copper roof were scrapped in favour of a lush living envelope that features a selection of exotic plants chosen by Patrick Blanc. The mezzanine is protected by textile netting and offers an expansive view through the building’s grand glass wall façade. 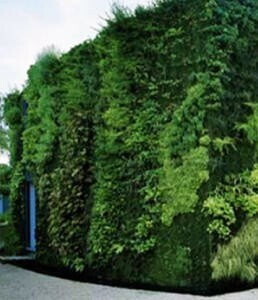 The vegetated facades face north, east and south to enhance privacy. Samyn and Partners worked together with Patrick Blanc to finalize the Vertical Garden concept. Through careful planning the team determined the necessary support systems, insulation and water-retention capabilities necessary for plant life. Felt stapled onto rigid PVC panels acts as a support system for irrigation and fertilization of the building’s beautiful green façade.